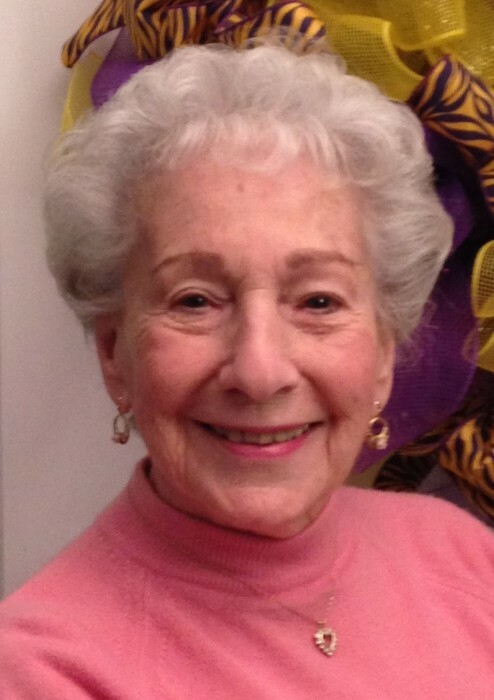 Lucille Claire (Fischer) Donnar entered heaven on April 12, 2019 at age 93 surrounded by her loving family. She was born on September 10, 1925 in New Orleans, LA and she never lost her love for her hometown. She was a diehard Saints fan even when they were losing. She was known for her welcoming hugs, wonderful humor, and amazing smile that would light up the room. She never met a stranger. She had a great love of dancing and could be found at White Sands Bowling Alley and the VFW dance floors having the time of her life. When she was not dancing, she could be found playing bingo and enjoying fellowship at the Elks Lodge 1795, the VFW Post 7674, and the American Legion Post 235. Along with dancing and bingo she filled her days with walking at the mall, lunching, playing cards, and chatting with cherished friends. Lucille's career extended over 30 years, working as a United States civil service employee. She held positions at New Orleans Naval Base, Houma Air Force Station, Hurlburt AFB, and Eglin AFB where she retired as Logistics Branch Chief earning the title of Manager of the Year in 1986. After retirement she also worked as the Santa Rosa Mall information lady where she made many friends. Lucy was a faithful member of St. Mary Catholic Church where she could be found in the front pew on Saturday evenings; her faith was the cornerstone of her life. Lucille is now reunited with her parents Charles and Josephine Myers, her siblings Bernice, Harold, Charles, and Anita as well as her late husband Bill Donnar. Left to cherish her memory are her children Robert Edgecombe Jr. (Susie), Bernice Edgecombe, Sheen Fischer (Editha), and Melissa Fischer MD. She is lovingly remembered by her grand children Trinity Rivera, Javan McCain, Robert Edgecombe III, Hardie Edgecombe, Marshal Fischer, and Quincy Fischer as well as her great grand children John, Nick, Alissa, Nina, Emma and Caroline. She was also dearly loved by Bill Donnar's children Barbara Deidrick, Deborah Pierce and Tracy Bice. Her family is grateful for the services of Vergil Brown MD and Staff, Thomas Manski MD, Yuan Wang MD, and Emerald Coast Hematology/Oncology. We would also like to thank Amedisys Home Health and Vitas Hospice for their care. Lucy's family invites you to join them in a Celebration of Life at the VFW Post 7674 located at 213 Carol Avenue in Fort Walton Beach on Wednesday April 17, 2019 from 5pm to 8pm to share wonderful memories. The Ladies Auxiliary will begin the celebration with a service. In lieu of flowers consider donations to the American Cancer Society or a charity of your choice.